Natasha Bacca is an artist and instructor based in Oregon. Her work explores light, combining contemporary and archaic processes to push the bounds of conventional photography. Her artwork has been exhibited internationally and is featured in private, public, and corporate collections. Collectors of her artwork include NASA, Hilton Hotels, Kaiser Permanente, Arizona State University, Northern Arizona University, Lane Community College, Central Oregon Community College, Deschutes Brewery, and many more. Her artwork has been featured on billboards across the United States, ABC's television shows Last Man Standing and Scandal, CBS's television show Two Broke Girls, OPB's television show Oregon Art Beat, and the soon to be released Untitled Chris Rock Film. In 2010, she was selected as the Jubelale artist for Deschutes Brewery. In November 2010, Oregon Public Broadcasting featured her process and artworks on the Emmy award winning television series Oregon Art Beat. 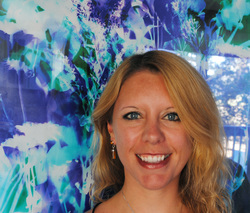 In January 2011, Natasha was granted a US patent for the process by which she creates her art. "During the time I was pursuing my photography based art degree I witnessed meteoric changes within the photographic world. The once commanding darkroom was being replaced by the newest computer lab, while prosperous photography businesses were closing their doors forever. I both embraced and questioned the digital world photography was being assimilated into. I delved further into the basic concepts of photography; where it came from, what it meant, and where it was going. Pondering the root words photo meaning light and graph meaning to write, I began exploring the concept of literally writing with light. Following extensive research, I developed various methods of painting with light on photosensitive paper and designed different tools for this purpose. I self-authored a patent for the tool and process by which I create my art which was granted in 2011. By looking critically and freshly at a well-known medium, I inaugurate new photographic practices that defy digital trends and open up new modes of praxis for art. Exploring and capturing light through formal and conceptual studies, I challenge traditional understanding of what a photograph is and how one is made. I emphasize process in art making, constructing conceptual reference to the medium itself. Combing cutting edge technology with the most archaic of processes, I push the bounds of conventional photography to invoke fresh alternatives to creating and appreciating art." University of Utah School of Dentistry, Salt Lake City, UT.